Corneta Gavilan Natural Polished Blade Machete | BUDK.com - Knives & Swords At The Lowest Prices! 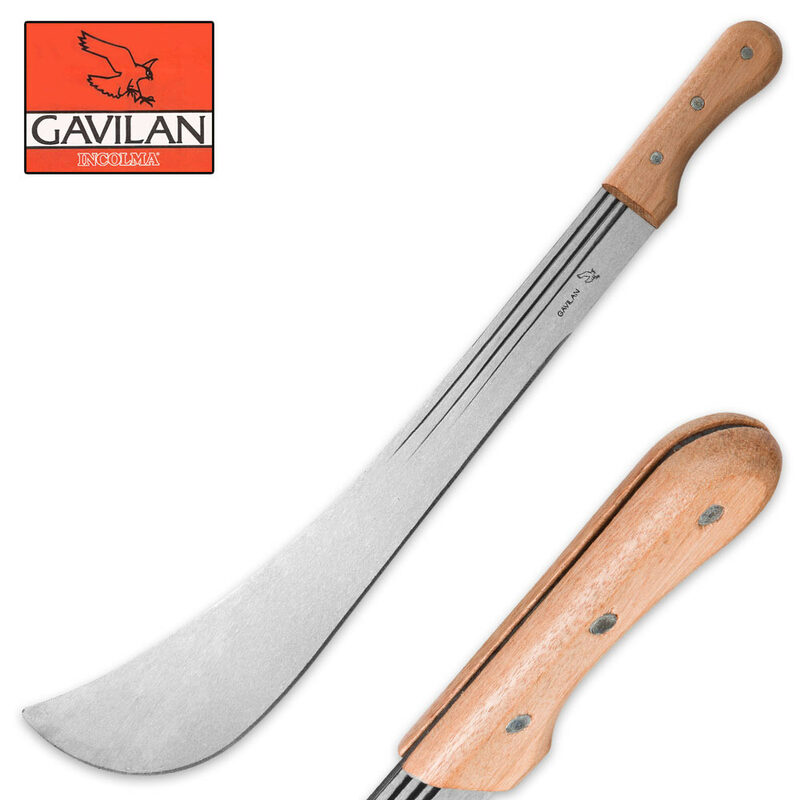 Add the Gavilan Corneta Gavilan Machete to your cache of necessary tools! The virtually indestructible machete has a 20” SAE 1074 high carbon steel blade that can hack and slash its way through even your hardest chores. The blade features a natural polished finish and deep blood grooves. 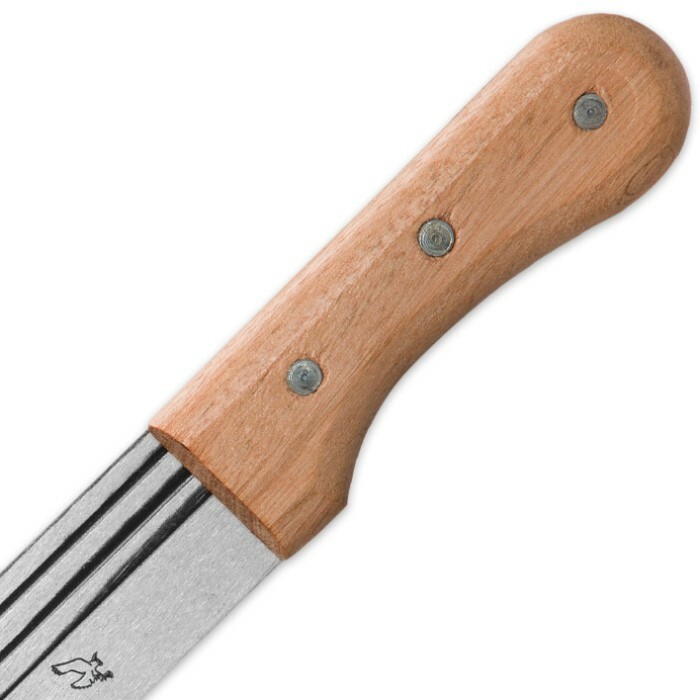 The full-tang, upswept blade is riveted to sturdy wooden handle that provides a comfortable, contoured no-slip grip. Make those chopping and cutting tasks easier for yourself! Get our new Corneta Gavilan Machete! This is not a toy! It is a better than average working machete. Considering the price I'd recommend it. This is a true machete not like the 6 dollar pieces of garbage you get in the camping section at Walmart. The steel is top quality. 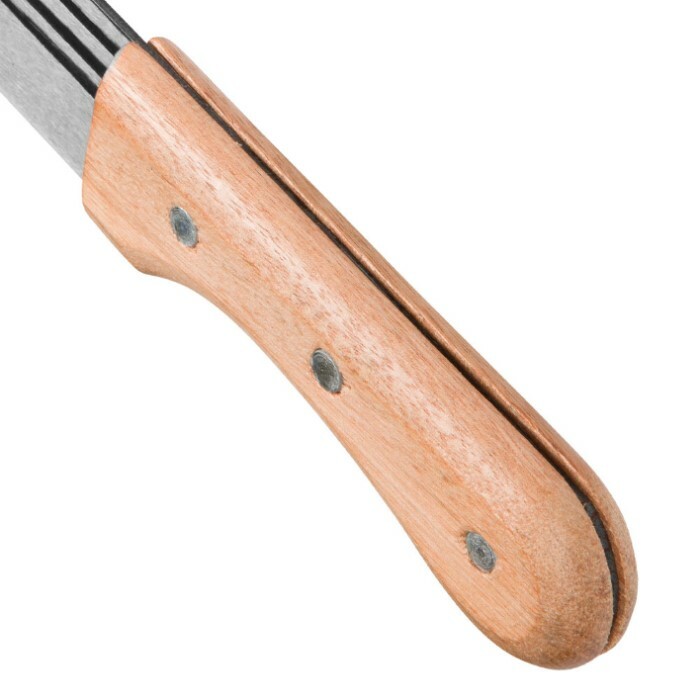 The handle scales are securely riveted and comfortable. It comes with hardly any edge so you will have to put one on. What you get is a big stout chopper for a very decent price. This tool will give you a lifetime of good service. Shrubs, vegetation, branches, saplings, and even the occasional zombie will fall to this machete. I gave it 5 stars because I got it on BOGO. Otherwise, it's a 4 star machete. Good for the price if you put some work in. This is a nice, heavy chopping machete, with good steel and a quality heat treatment. The downside though is in the fit and finish, the tang on mine was smaller than the handle, which necessitated sanding down and refinishing it. Also the edge needed some serious work, it is "sharp" but not sharp enough, and it was pretty rough in some spots too. All that being said, if you need a good heavy duty machete for not a lot of money, this is a great deal if you are willing to make some improvements to it yourself.